You are viewing the the walking dead tag archive. What Would Carl from the Walking Dead Read? “Yeah I like it here. I like the people. But they’re weak. And I don’t want us to get weak too.” Carl Grimes from the AMC television show The Walking Dead is one of the toughest teen characters I have ever seen. He has grown up in a world of chaos and woe ever since he was a young lad. He has survived some of the most horrifying zombies or “walkers” as he would call them and lost his own after she gave birth to his baby sister and he had to be the one to make sure she didn’t turn into a zombie. Carl can really take care of himself, even though he can give into his childish cravings and love for chocolate puddings every once in a while. He understands the depravity of the world that he lives in and he is never afraid to take charge in chaotic situations. 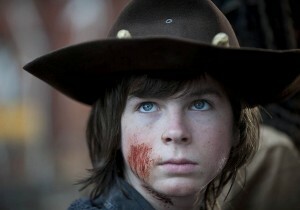 His dad Rick should be proud that Carl has transitioned so well in such a wild and unruly world. Carl should be proud of himself for learning how to shoot a gun and knock out as many “walkers” as he can. Way to go Carl! If Carl walked into my library right now what books would I recommend to him? Let’s see, I think I have a few he will really like. Now I don’t really think that Carl needs this book, but I do think he would get a big kick out of reading it. He might think that some of the tips that Brooks offers would be helpful in the world that has been stricken by the zombie apocalypse. 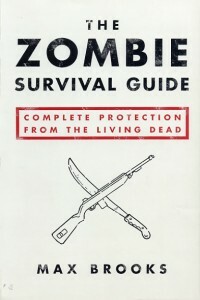 This unique survival guide offers helpful tips such as weapons and combat techniques, places to stay safe, and how to survive a zombie-infested world. Did you know that if properly cared for the human body can be the best weapon of all? 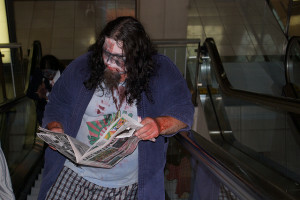 More importantly, the chapter on how the zombie virus is spread may make the average reader squeamish, but not Carl he will understand the treatment for an infected bite is usually amputation. There are also references to the different kinds of zombies like voodoo, movie zombies, and the deadly incurable virus zombies. Continue reading What Would Carl from the Walking Dead Read? I love all things zombie and The Walking Dead TV series on AMC certainly gives me my fill every week. Even when I think I can’t watch any more because I’ll get too scared, I’m sucked in and then I’m talking about it with a friend the next day. A lot of the teens at the library where I work watch the show and read the graphic novels. In recent episodes one of the characters, Carl, asks for more comic books when other go out on a raid, and Carol reads to kids at a story time… before she also teaches them some crucial defensive knife skills! This got me to thinking about reading in the time of a zombie apocalypse. What do you do: read as many zombie novels as you can find because that’s how your life is now? Or read to escape your horrifying world? The Walking Dead TV series, and comics to a certain extent, exist in a world that requires a bit of stretching of the imagination. There are zombies, after all. In keeping with that imaginations, here’s my hypothetical episode for this week: the gang goes on a raid into town looking for food and supplies when they stumble across a public library! Rick decides they should all get some reading material to get them through their brief downtimes when the zombies aren’t trying make dinner out of their brains. Fighting their way through a crowd of zombie librarians, they get to a safe space to hole up for a while: the YA section! Here are my recommendations for what each character should read.